Wobblers Syndrome isn't common, but it's important to understand it because it can look similar to other diseases such as EPM. When a vet makes a diagnosis of Wobblers Syndrome, testing must be done to rule out other neurological diseases. Interestingly, dogs can also have a canine version of Wobblers Syndrome. It is not zoonotic or contagious in any way, so there's no concern with passing the disease from animal to animal or to humans. Nor is Wobblers Syndrome a death sentence. If left untreated, it can have serious consequences, but most owners will notice the condition before it progresses too far and with the help of a veterinarian, return their horse to good health. Wobblers is not a specific disease but a blanket name that covers a variety of conditions. Wobblers may be caused by compression or malformation of the spine in the neck that makes the animal stiff and uncoordinated. The horse may be born with a predisposition, there may be a nutritional connection or an injury. This is why it is so important to patiently teach a youngster to stand quietly while tied and to tie adult horses safely. A fall in the pasture while playing, or while being ridden may damage the vertebrae in the neck. Whatever the reason, the deformed or compressed vertebrae press against the spinal column, mixing up the messages from the brain to the limbs. Some breeds such as Morgan Horse, Quarter Horses and Thoroughbreds seem to be most affected. Horses with long willowy necks are felt to be more prone to developing Wobblers. Horses with Wobblers Syndrome will trip often and be stiff and uncoordinated when they move. They may appear to lurch as they canter, have difficulty halting smoothly and collide the hind with the front feet. Walking up and down hills may be difficult. The hind end will appear to be more involved than the forequarters. As the condition advances, they may step on their own heels, causing lacerations, which in turn can cause lameness. If these cuts are left untreated, they can easily become infected. The horse can lose condition and become progressively weaker. The horse may fall easily and have difficulty getting up. Although Wobblers won't cause death if left untreated, it will make life a struggle for the animal and a hazard for the handler or rider. 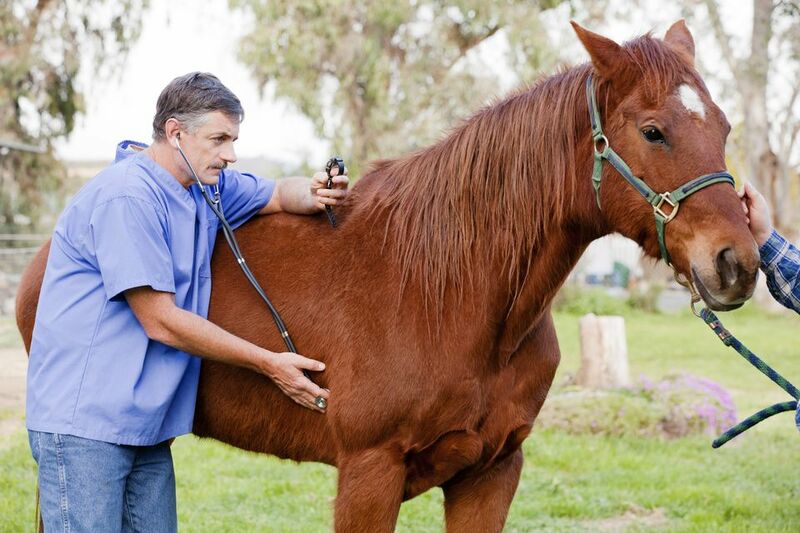 If your horse appears even slightly uncoordinated or is tripping more than usual it's time to call the vet. Tripping occasionally can be a result of long hooves, but if the horse is getting regular farrier work, then un-kept feet aren't likely the problem. Your vet will first take blood and spinal fluid tests to determine if another neurological disease like EPM or ​WNV is the problem. Physical tests include turning the horse in a tight circle and watching for hind-end coordination problems and backing the horse up, which will be difficult if the messages from the brain to the hind end are getting scrambled. If no other conditions exist, imaging will be done to look for tumors, vertebrae damage or other injuries. Depending on the exact cause of the Wobblers Syndrome, treatment can include surgery, drug therapy and changes in the horse's management. Drugs can help reduce swelling that might be impairing the spinal column. Surgery can be done to support the damaged vertebrae. Nutritional therapy, physiotherapy, stall rest and exercise can all contribute to rea horse’s recovery from Wobblers Syndrome. Recovery can be lengthy and if the horse was used for competition, it may never return to its previous performance level (although some do). Unfortunately, there is no way to prevent a horse from developing Wobblers Syndrome. Care should be taken to prevent the young stock from too-rapid growth. However, if injury or genetic predisposition are factors, there is little we can do.